You are no doubt aware that characterization is a central aspect of catalyst development to understand the properties of the materials utilized (e.g., structure, composition, morphology, chemical properties), the mechanism of the catalytic reaction (adsorbates and intermediates present on the surfaces of the catalysts during reaction, reaction pathways), and the reversible/irreversible transformation during catalytic operations. The importance of being able to characterize a catalyst under inert and reaction conditions cannot be overstated. Only with the accurate description on the catalyst can one begin to alter synthesis methods intelligently to produce catalysts with the unique properties desired. TCGR’s Catalytic Advances Program (CAP) plays an important role in keeping industry decision makers and R&D scientists up to date around the world. Its new technical report, entitled Advances in Catalyst Characterization and Synthesis, reviews the advances in industrial catalyst characterization and synthesis over the past five years. It contains insights into the progress and issues essential in developing more active, selective, and durable catalysts, and in optimizing reaction conditions. The last decade has been defined by significant advances in the characterization of solid catalysts, particularly in the analysis of the nature of the catalyst and of the reaction mechanism during catalytic operations. 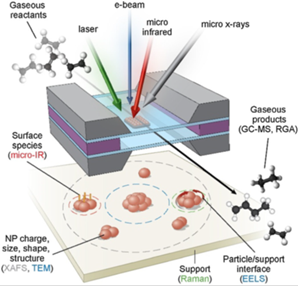 New sophisticated characterization tools, or their significant update, has opened new possibilities, including integration of spatially and temporally resolved spectroscopy with microscopy methods as well as real-time spectroscopy. However, relevant progress has been made in the entire field of the characterization of solid catalysts, from the improved understanding of the identification of the reactive species and in bridging model to real reaction conditions, to better understand the role of catalyst nanoarchitecture, which relates to the advancements in the fine control of nanotopology of the catalytic surfaces. through use of a Portable Microreactor, ChemCatChem 2015, 7, 3683. Impressive advances have also been made in the development of 4D methods — which allow a spatio-temporal analysis of the catalysts. The advances in these areas and the integration of multiple techniques has allowed significant progress in understanding the reaction mechanism, and catalyst dynamics. It should be commented, however, that sometimes these advanced techniques offer just a sophisticated methodology for results, which can be obtained with simpler and less costly methods. Figure 2. 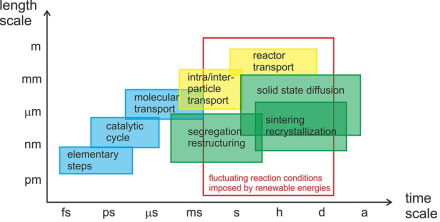 Typical time and length scales relevant for dynamic processes in catalysis. Catalysts under Dynamic Reaction Conditions, ChemCatChem 2017, 9, 17. Presently there are multiple important trends in catalyst synthesis, reflecting the current breadth of the enterprise. From new zeolites and MOFs to hierarchical structures to highly stepped metal nanoparticles to metal catalysts with oxide “overcoats.” There’s a lot going on, and the synthetic methods used in one area don’t always translate to another. While sophisticated morphological structuring of oxide supports and catalysts at multiple length scales has clearly taken great strides recently, there are still many potential avenues of exploration in the control of the homogeneity on the nanoscale of mixed metal oxides. Atomic layer disposition (ALD) and related methods may play an increasing role in this area in the future. However, one can speculate that in many cases mixed-metal oxide catalysts will ultimately be replaced by tethered organic or organometallic functionalities supported on a short A-list of support oxides whose pore structures are easily manipulated (e.g., silicas). As seen in this CAP technical report, such developments are occurring (e.g., tandem acid-base catalysts) and will undoubtedly accelerate with increasing sophistication of the synthetic methods, leading to more catalysts containing multiple functional groups (and, unlike materials such as activated carbons, only the desired groups) that are capable of handling cascade reactions. TCGR’s Catalytic Advances Program (CAP) is an information resource for research and development organizations in the chemical, polymer, and petroleum industries. Depending on their membership choice, CAP members may receive all three or just two annual technical reports as well as the weekly newsletter known as CAP Communications. This newsletter provides the latest updates on technical breakthroughs, commercial advancements, noteworthy conference proceedings, and exclusive development opportunities. Membership also includes attendance at a CAP Annual Meeting, with dates, location, and topics selected by the membership. More information about this and other services of the Catalytic Advances Program (CAP) can be seen at http://www.catalystgrp.com/php/tcgr_catalyticadvancesprogram.php. Call +1-215-628-4447 or e-mail John J. Murphy at jmurphy@catalystgrp.com, and we’ll be happy to discuss these and other interesting membership benefits. developments in catalysis as they apply to the global refining, petrochemical, fine/specialty chemical, pharmaceutical, polymer/elastomer and environmental industries.